I can't believe it is 2011! Last year FLEW by! I want to wish you all a very happy, healthy New Year! How did you ring in 2011? We got all dressed up and headed down to Nashville for the night. And spent the night with my fabulous best friend, Megan, and her boyfriend. Her birthday is New Year's Day so we helped her celebrate that too. We stayed at the Sheraton downtown and walked down to Broadway to watch the Guitar drop at midnight. 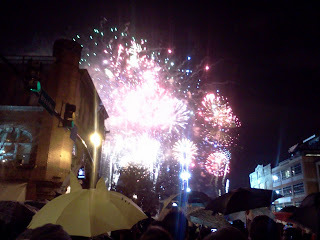 Luckily, the rain held off long enough and when it did start raining, it wasn't too bad. But we had a great night hanging out and bringing 2011 in with a bang. But did you all make any resolutions?! I normally don't and if I do, I don't like to call them resolutions. More like... Hopes/Wishes. 1.) My number one HOPE/WISH again this year is that we finally have a baby. It has been a 2+ year battle trying to get pregnant and I just hope it finally happens this year. 2.) I HOPE/WISH that I can get back into my Etsy shop and make it a greater success. I've slacked with it for quite some time now and I really need to do something with it or consider closing it. 3.) I HOPE/WISH that I can continue having a great time blogging. I hope to continue to inspire you all and make fabulous new friends along the way. And I hope my creativity continues with little roadblocks. 5.) I HOPE/WISH to make leaps and bounds paying off what debt we do have, especially now that we just added a new car payment. I hope that each of you have a FABULOUS 2011 thriving to achieve any of your goals that you have set for yourself! My little etsy shop is sadly neglected, too. May they both be better nurtured in the new year! Love your pictures, you and your hubby are an adorable couple! Wishing you bunches of blessings this new year! Thanks for the comment...Looks like your New Years Eve was oodles of fun!! =)) Happy New Year to you and yours!! Great "hopes/wishes" :) I like to consider my "resolutions" goals to work on for the new year. Happy New Year!! Looks like y'all had fun! I hope all your dreams and wishes come true this year too! Happy New Year! I didn't know you were trying to get pregnant...I'll send up a prayer for you! I am really excited for the day we can "start trying"...but I am also surrounded my people who have been trying for so long with little success. Keep us posted!!!! Sounds like some great Hopes/Wishes! Our friends just welcomes a beautiful baby boy after a LONG road of trying....I hope and wish for you the same to come in 2011. Hope you had a great time in Nashville....funny, I have lived here basically all my life and I have only done the Nashville fireworks from a distance. Great photos.